This DVD set is available for sale to Shambhala Centres and Groups for $108.00 and to individuals for $54.00. Why is there a different price for centres and individuals? The reason is simple; centres and groups have the opportunity to earn income by holding classes based on the DVD set. DVD sets purchased by individuals are intended for home study. In these talks from two 1975 seminars, presented here in digital formats for the first time, Trungpa Rinpoche lays the ground we need to gain a deeper appreciation of the sadhana. 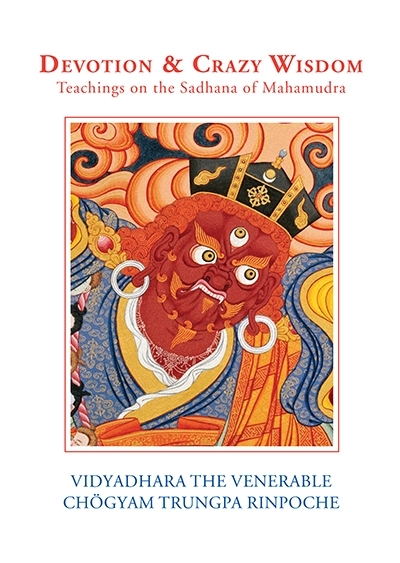 In ten talks—six in video and four in audio—the Vidyadhara explains the literal meaning of unfamiliar terms in the sadhana and unpacks the deeper meanings within.Taken together, the talks form the basis for a commentary on the practice. Following long tradition, we study the commentary to derive more richness from the practice itself. Additional publications on The Sadhana of Mahamudra available from Nalanda Translation Committee.